Figure 1. Algal Bloom Covers A Lake. Photo Source: Zwerneman 2014. In 2014 and 2015 toxic algal blooms on Lake Erie caused the City of Toledo to warn residents not to drink the city’s public water. This algal bloom has become a more-or-less annual event. In 2015, a plume of algae spread along the Ohio River, covering 636 miles, about 2/3 of the entire river, from Wheeling WV, to Cannelton IN. For more than a month it curbed boating, caused problems for water utilities, and drove swimmers out of the water. This year (so far, at least) the headlines were grabbed by a toxic algal bloom in Florida. The green slime originated in Lake Okeechobee, then spread via rivers to the Fort Meyers area on the west, and especially to the Stewart area on the east. States of emergency were declared in Martin, Lee, St. Lucie, and Palm Beach Counties. These are all examples of Harmful Algal Blooms, or HABs. What’s going on, and how has Missouri been affected? Algal blooms are caused by microorganisms. They occur naturally in all water, and are only absent if you purify and treat the water. Even in purified water, as every swimming pool or aquarium owner knows, they will multiply and slime your water if you don’t give the water constant vigilance. 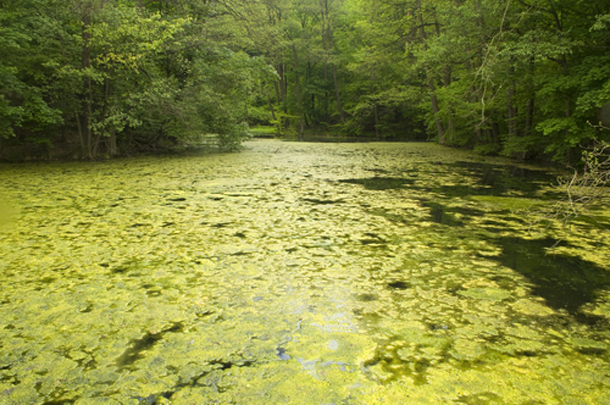 The most common of the microorganisms is often called blue-green algae. Despite its common name, it is not algae at all, but a phylum of bacteria, called cyanobacteria. Most species of it are harmless, but some species are toxic. Sometimes conditions conspire to cause these bacteria to multiply explosively, causing what we call an algal bloom. These blooms sometimes contain significant numbers of toxic microorganisms, which make drinking the water, or even swimming in it, hazardous. The most common of these is a genus called microcystis. For some reason HABs are increasing in frequency. In most cases, casual contact with the water causes mild reactions like rashes. Drinking it, however, can cause liver damage, and can even be fatal. They are harmful to wildlife as well as humans, and can cause large fish kills. Many of the HABs occur along our nation’s seacoasts. Missouri is an inland state, however, so for the rest of this post I will concern myself only with algal blooms on freshwater systems. HABs are a relatively recent subject of study, so nobody knows how often they have occurred and where. Similarly, in a state like Missouri, many of them occur in relatively small bodies of water that may not be monitored. Thus, the blooms may go undetected. Figure 2. Source: Lopez et al, 2008. HABs causing significant large-scale disruption have not yet been reported in Missouri, but as Figure 2 shows, they have been reported in many of our neighboring states. There is no reason to believe that Missouri is immune. Toxins were present in only 4.0-7.7% of samples, depending on the toxin. Thus, the presence of algae, and even of toxic species of algae, does not necessarily mean that the water is unsafe. Only when a bloom causes the number of toxic cyanobacteria to increase does the situation become problematic. 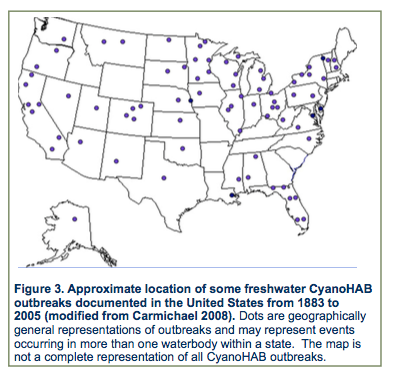 Figures 3, 4, and 5 show the sites tested, and the locations of sites where the cyanobacteria toxins were found. Figure 3 shows Cylindrospermopsin, Figure 4 shows Saxitoxin, and Figure 5 shows Microcystin. The color codes for the concentration: clear means none detected, blue means detected at low concentrations, yellow means detected at moderate concentrations, and red means detected at high concentrations. 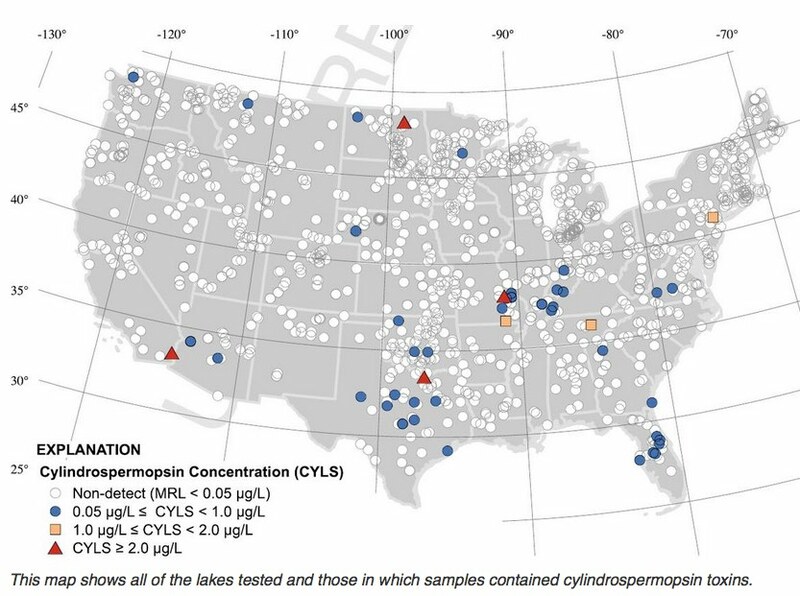 Microcystin and Cylindrospermopsin were detected in Missouri, the latter at a high concentration. Figure 3. Source: USGS 2016a. Figure 4. Source: USGS 2016a. Figure 5. Source: USGS 2016a. Figure 6. Photo by John May, 2016. Some of this should not be surprising. I suspect that any of us who have spent time near bodies of water in Missouri have seen algae on them. Indeed, Figure 6 shows an algal bloom occurring on a lagoon in Forest Park in St. Louis on the day I wrote this article (7/21/16). The light green material in the water is the algae. Missouri tests lakes for the concentration of chlorophyll-a, but not streams. Chlorophyll-a is a green pigment associated with organisms that do photosynthesis. It is present in cyanobacteria, and the assumption is that chlorophyll-a levels indicate the amount of cyanobacteria in the water. In 2014, excess levels of chlorophyll-a impaired more acres of Missouri lakes than any other cause. Lakes in all regions of Missouri are showing increasing trends in chlorophyll-a levels, with trends in the Glaciated Plains and Osage Plains regions being statistically significant. While a useful water quality standard, the reported concentration of chlorophyll-a only represents the level at the time testing occurred. It cannot be translated into the presence or absence of an algal bloom at other times during the year. Further, the USGS assessment found that chlorophyll-a is not a reliable indicator of the presence of algal toxins. Neither algal counts nor algal toxins are tested in Missouri’s surface water or in Missouri’s drinking water. The Department of Conservation encourages the reporting of fish kills in the state, but there is no system for reporting or tabulating algal blooms. Phosphorus appears to be the factor that most limits algal growth in Missouri’s lakes. Where algae has access to phosphorus, it grows more vigorously. Phosphorus is a pollutant that flows into Missouri’s lakes from some industrial or urban sources, but it is especially an agricultural chemical that runs off from fertilized farms. Much of Missouri’s population draws its drinking water from the Missouri and Mississippi Rivers. Iowa, Illinois, Kansas, Minnesota, Nebraska, and Wisconsin are among the nation’s most intensively farmed states, and Missouri is downstream from all of them. Could our two rivers experience HABs as did Lake Erie and the Ohio River? Could HABs make our water undrinkable? For how long? Is there a reason to think that Missouri should be immune from such problems? I don’t know of one. So far we have dodged the bullet. When or how a seriously disruptive HAB might occur in Missouri is anybody’s guess. Dewey, Eliza. “Where Will the Green Slime Go? Florida Tracks Spreading Algae.” The Miami Herald. 7/7/2016. Viewed online 7/21/16 at http://www.miamiherald.com/news/local/environment/article88302462.html. Lakes of Missouri Volunteer Program. Blue Green Algae in Missouri. Downloaded 7/21/16 from http://lmvp.org/bluegreen. Lopez, C.B., Jewett, E.B., Dortch, Q., Walton, B.T., Hudnell, H.K. 2008. Scientific Assessment of Freshwater Harmful Algal Blooms. Interagency Working Group on Harmful Algal Blooms, Hypoxia, and Human Health of the Joint Subcommittee on Ocean Science and Technology. Washington, DC. https://www.whitehouse.gov/sites/default/files/microsites/ostp/frshh2o0708.pdf. Missouri Department of Natural Resources. 2015. Missouri Integrated Water Quality Report and Section 303(d) List, 2014. Downloaded 4/20/2016 from http://dnr.mo.gov/env/wpp/waterquality/303d/303d.htm. Neuhaus, Les. “Miles of Algae and a Multitude of Hazards.” The New York Times. 7/18/2016. Viewed online 7/21/16 at http://www.nytimes.com/2016/07/19/science/algae-blooms-beaches.html. United States Geological Survey. 2016a. New Science Challenges Old Assumptions about Harmful Algal Blooms. Viewed online at https://www.usgs.gov/news/new-science-challenges-old-assumptions-about-harmful-algal-blooms. United States Geological Survery. 2016b. 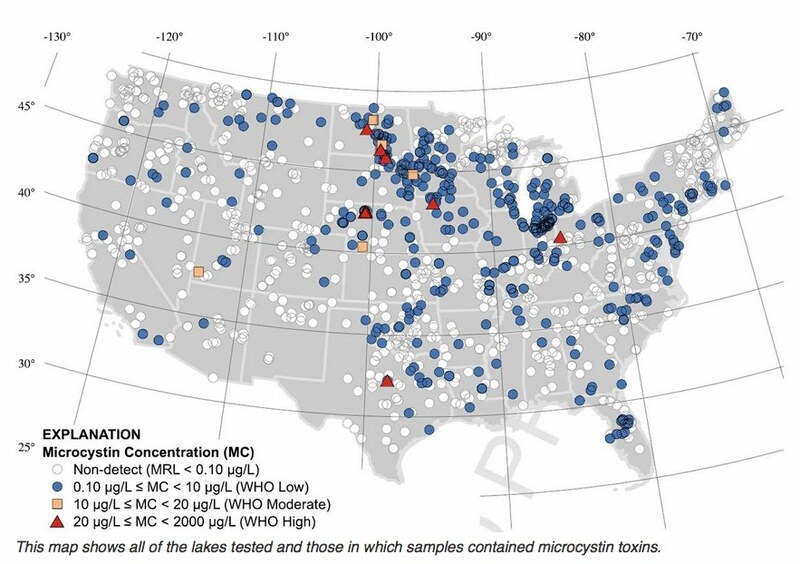 New Study on Cyanotoxins in Lakes and Reservoirs Provides Insights into Assessing Health Risks. 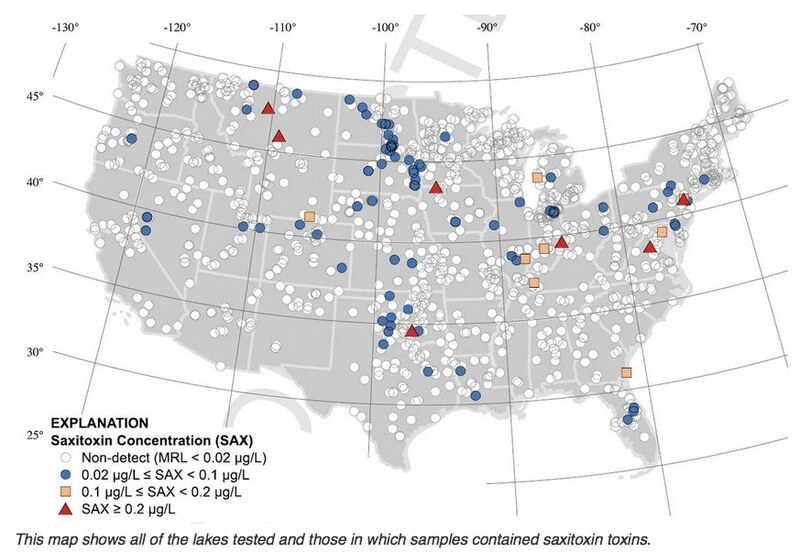 Viewed online 7/22/2016 at http://toxics.usgs.gov/highlights/2016-05-31-cyanotoxins_in_lakes.html. Wines, Michael. “Toxic Algae Outbrteak Overwhelms a Polluted Ohio River.” The New York Times. 9/30/2015. Viewed online 7/22/16 at http://www.nytimes.com/2015/10/01/us/toxic-algae-outbreak-overwhelms-a-polluted-ohio-river.html. Zwerneman, Annie. 2014. Monitoring Harmful Algal Blooms? There’s an App for That! The EPA Blog, 7/17/14. Downloaded 7/22/16 from https://blog.epa.gov/blog/tag/usgs. By mogreenstats in Other Water, Water on 2016/10/13 . While not testing algae blooms, the state does have a standard for Dissolved Oxygen (DO) in its waters. Volunteers on Missouri Stream Teams test for this in their basic chemical analyses of stream water quality. 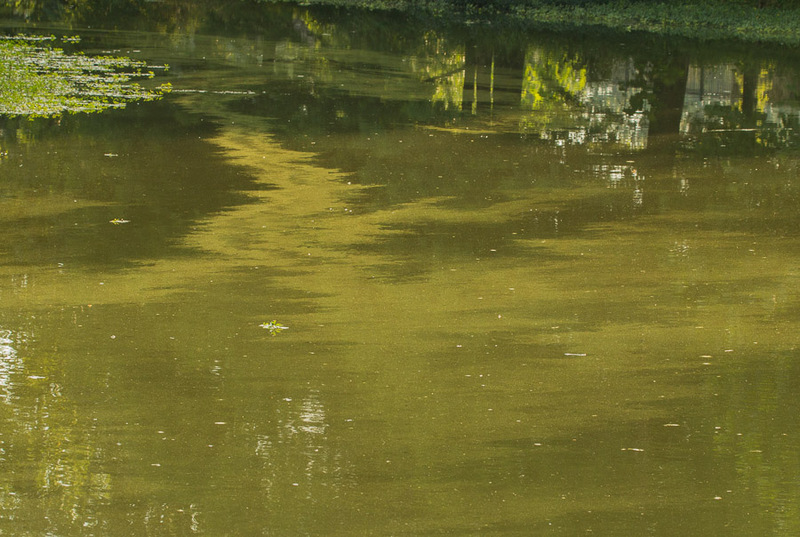 Low dissolved oxygen levels usually result when there are algae blooms because the algae “eat up” the oxygen in the water in the photosynthesis process. Since fish require some level of oxygen in their water, they die when DO levels become too low. Thus large or heavy algae blooms tend to result in fish die off. This statement in the article above may not be correct. Chl a is present even in Diatom Algae and Diatoms are brown. Since Chl a is present even in Green Algae and Diatoms, it does indicate the amount of Cyanobacteria in the water. It only indicates the total amount of all types of phytoplankton.